There's No Place Like Home: The Room's Not Done Yet, OK? Everybody wants to see Katie's nursery! Well, it's still a mess and has piles everywhere. We just moved 2 weeks ago and had a baby 4 weeks ago, so cut me some slack! If it weren't for the move, the room would have been done in March. We also had another hold up. 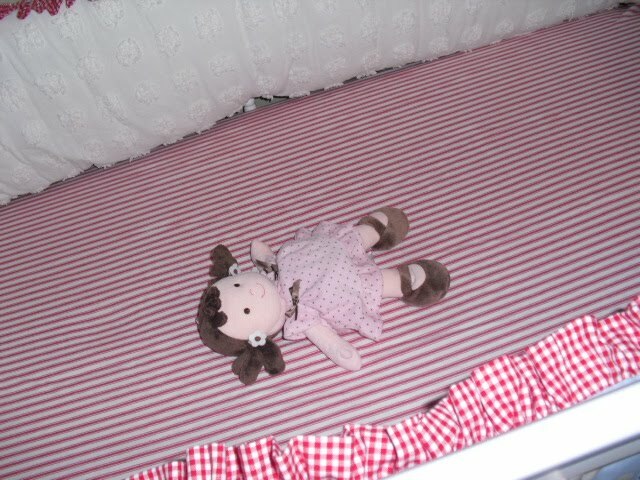 I have had Katie's bedding picked out for 5 years! When I found out I was having a girl, I ordered it right away. 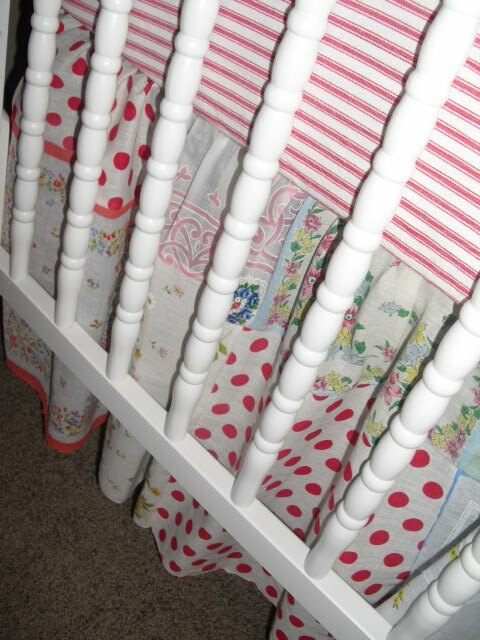 When it came, the bed skirt was totally different from the picture. The bed skirt that came had lots of ugly cartoon characters on them. They changed the fabric, but not their picture online. I was so sad! 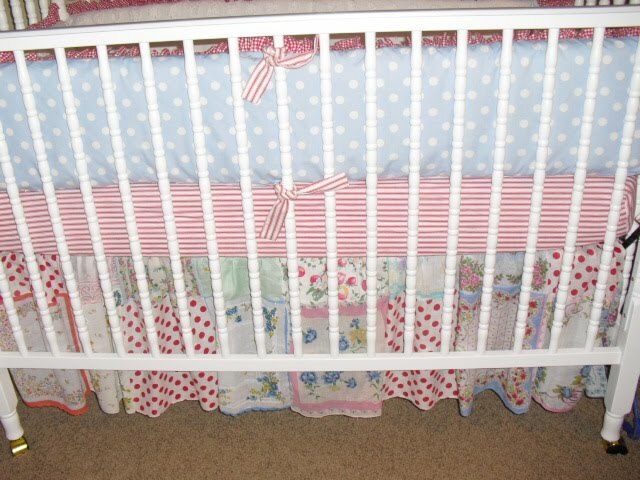 Anyway, my sister in law came to the rescue...again, and made Katie's bed skirt. I love how it turned out. I got my hankies from Golightly's and the red and white polk a dot fabric is from the curtains in my old kitchen windows. Those actually came from Golightly's too! Good Night sweet Katie, and Happy 4 week birthday of being in the world. P.S. The room, and the rest of the house, will hopefully be done soon. I will share with you as soon as I can! I felt SOOOOOOOO bad after I left you a message about showing us Katie's room. I know how busy you are girl, believe me. 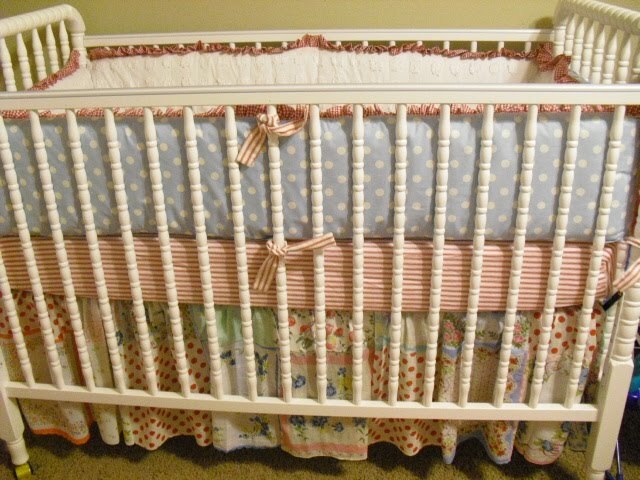 I really really like how the bedskirt turned out, now it's even more special since your SIL made it for her. :) Hope you're doing well and goodness, don't feel like you need to break your back to show us the house pics. Sadly, my two-year-old girl wants a car bed. A car bed?! What is girly about that?! Maybe I can find one in PINK. ha! That bedskirt is amazing! I love it! I'm just absolutely floored that you do as much as you do-despite being pregnant! despite having a newborn! despite moving! I am so excited to see what you do and feel so lucky that you post so often! Your home is so cheerful and beautiful and I admire your high spirits! Congratulations on a new beautiful baby to match your beautiful home:) Fun! 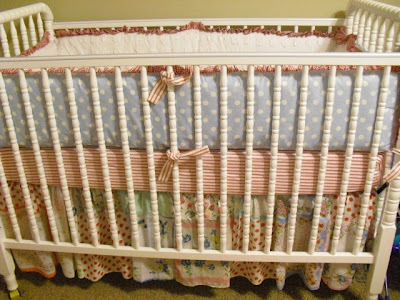 I can't wait to see the whole nursery. Caroline's room is a huge mess of piles too. With the suprise of a girl we are redoing and pulling out girl clothes and putting up boy ones. It's hard to get things done, I just want to hold her and look at her all day. Katie is so cute, what a little blessing! Love her little outfits!!! 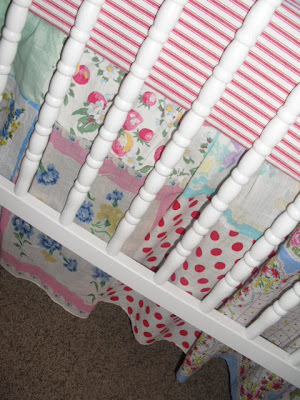 Her bedding is beautiful, glad you got the bedskirt made just like you imagined. Katie is a DOLL!!! Can I squish her? I cant wait to see it all finished.......I LOVE your interior design style so much!! Hey Dina! My Mom introduced me to your blog a few days ago. I absolutely love all of your unique decorating ideas. 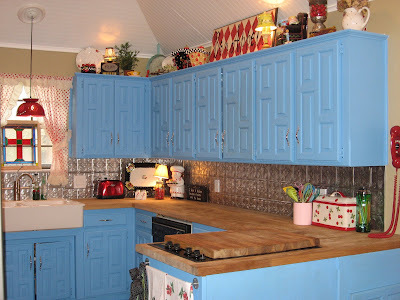 I wrote a reference to your kitchen in my latest post, and included one of your pictures for my friends to see. I hope you don't mind. Best of luck with the move! UGH, you guys picked one horribly hot time of the year for it. I can't imagine, especially with a new baby. Don't rush yourself, wait until it cools off some, and you will be able to get 10 times more done! Oh Dina!!! I've been somewhat absent in blog world lately and I'm just now seeing all of your house pics!!! LOVE LOVE LOVE the nursery bedding! Of course, I wouldn't expect any less from you friend! I would love to meet Katie and play with yall soon!